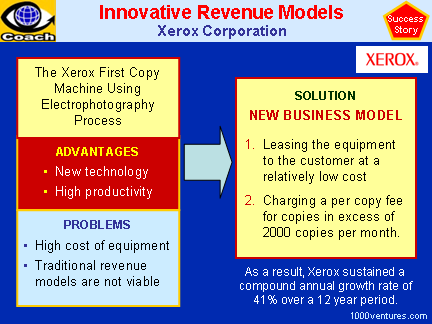 Xerox Corporation's early days in the copy machine business with its Xerox Model 914 copier illustrate the importance of the → Business Model and innovative → Revenue Model. The Model 914 used the relatively new electrophotography process, which is a dry process that avoids the use of wet chemicals. In seeking potential marketing partners, the company repeatedly was turned down by the likes of Kodak, GE, and IBM, who had concluded that there was no future in the technology as seen through the lens of the then-prevalent business model. While the technology was superior to earlier copy methods, the cost of the machine was six to seven times more expensive than alternative technologies. The model of selling the equipment below cost and making up the difference by large margins in the sale of supplies was not viable because the cost of the supplies was about the same as that of the alternatives, so there was little room to maneuver. The new model leased the equipment to the customer at a relatively low cost and then charged a per copy fee for copies in excess of 2000 copies per month. At that time, the average business copier produced an average of only 15-20 copies per day. For this model to be profitable to Xerox, the use of copies would have to increase substantially. Fortunately for Xerox, the quality and the convenience of the new copy technology proved itself and companies began to make thousands of copies per day. As a result, Xerox sustained a compound annual growth rate of 41% over a 12 year period. Without this business model, Xerox might not have been successful in → commercializing the innovation .